Happy Friday everyone! I’m so ready for the weekend. It’s been gloomy and rainy here, but I don’t even care. The weather won’t drag down my spirits before Superbowl weekend!! 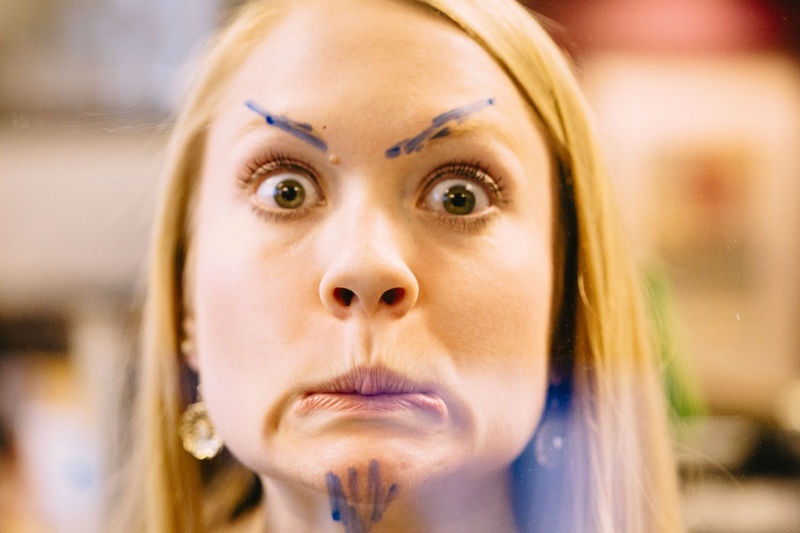 But before I start rambling, look at this super attractive photo my coworker took of me this morning! We have a new glass panel in our office that is perfect for standing behind and drawing funny faces on people. So that’s what we did for a good chunk of the morning. Don’t judge. It’s Friday. So yesterday I started pondering my running plans for the weekend… I checked my Little Rock marathon training schedule to make sure I wasn’t crazy. 20 Miles. 20. Miles. Holy cow. That one’s gonna hurt. 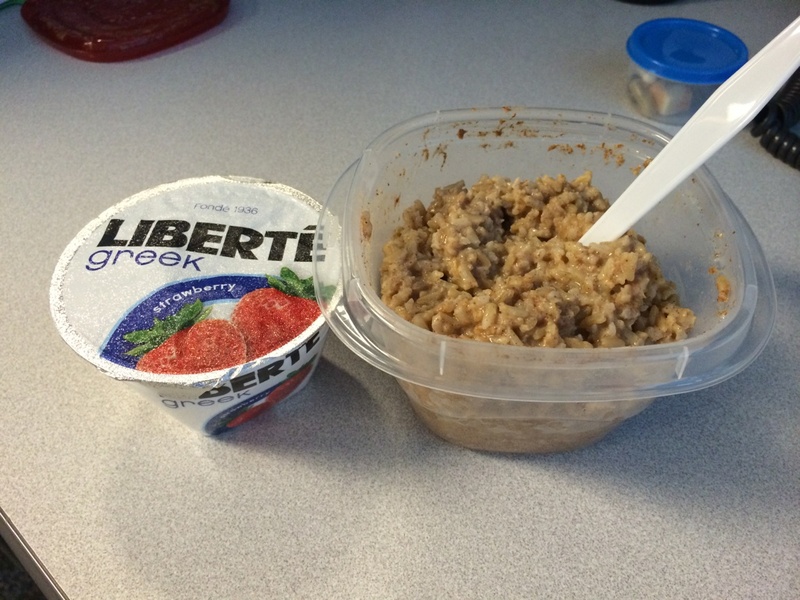 I decided a mini carbload could only help the situation, so I started today with brown rice and Greek yogurt. Then for lunch I had some tortilla chips and cottage cheese followed by an open-faced bagel sandwich. Disregard the cheese….I was craving it and decided the one piece would be worth the pain. So far so good. 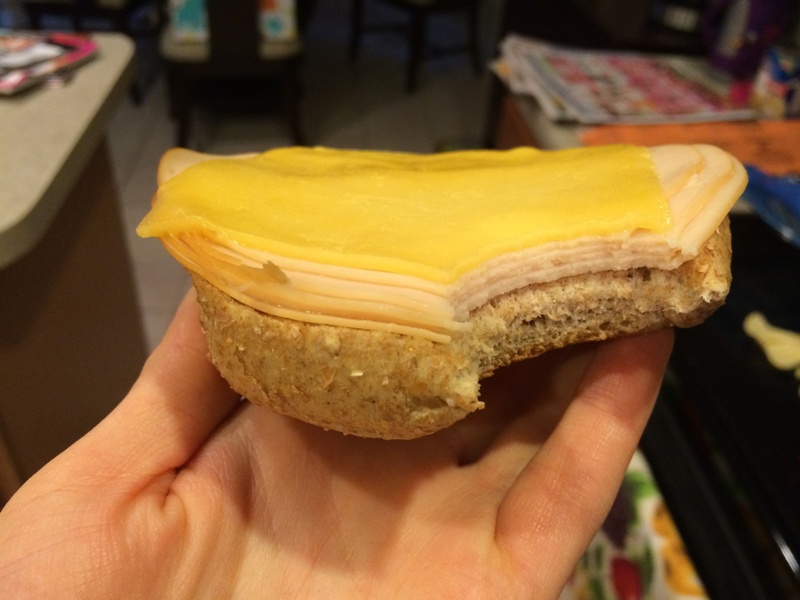 🙂 I had half a bagel leftover from carb loading last week, so I microwaved it with some chicken deli meat + Gouda cheese. It was delish! With my long runs for the next 2 weeks being so long, right at or exceeding 3 hours, I started wondering if this is really good for me. And is it really necessary to do it all at once? Well Google only confused me on the subject of splitting up long runs (darn those other running blogs! ), but I think I’ve come to the conclusion that I need to shoot to do it all at once. BUT, if I have to split it up due to social events, weather, etc, it won’t be the end of the world. Many people mentioned that running longer than 3 hours can set you up for more injuries and will take longer to recuperate before your next run. I was happy to hear this as we are forecasted to have lots of rain tonight and into tomorrow morning that could mess up my 3 hour running plan. You’re thinking – just run after it stops?! Right?! I know. But I’m so OCD about when and where I run. I want to get out early while it’s still dark. I want to run on some roads that get too busy later in the day. And I just want to the rain to go away so I can do these things on Saturday morning! But you’re right. I could just wait it out as the rain is supposed to subside late morning. And Sunday is always an option as well – working around Jazzercise and the Super Bowl, of course! So the main point of these ramblings? I realize I need to be flexible with my weekend training schedule. And if my run has to be split into 2 sessions, then that’s okay too! And just to throw in one more curveball…we have lots of snow in the forecast for next week! Holy smokes! I’m a horrible sports fan. I rarely even know the teams that are playing in these major games, unless it’s a team from Missouri of course! But I’m the sucker that still gives into the ‘hype’ of the game. I will watch the pregame show, the puppy bowl, the whole game, commercials, and the half-time show. And I will eat chicken wings and chips and be excited for whichever team wins. And I will go back to not really caring Monday morning. Nothing against the game or sport – I’m just not that attached to it! If you do have plans, I hope you have tons of fun! Have a great weekend and I’ll talk to you all soon!